Nissan has launched a new fast charger for fleets and business owners as it looks to spearhead the adoption of electric vehicles by businesses. The Nissan event included the world premiere of the new longer range e-NV200 van. Unveiled at the carmaker’s third ‘Nissan Futures’ event in Oslo, Norway, the 22kW charger enables fleet drivers to charge Nissan electric vehicles in two hours, without the cost or supply upgrades of installing a rapid charger. 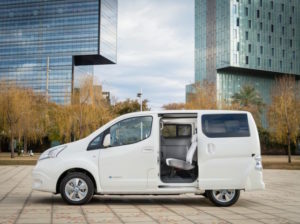 The new charging solutions were unveiled as Nissan also announced its new longer range e-NV200 full-electric van.Subject to final homologation, the new model will offer a 174-mile range – up by 62 miles or 60% on the current model. The new model was announced as Nissan alsogave the European premiere of the new LEAF,with a special ‘2.ZERO’ version for Europe. Other significant announcements made at the event include a UK collaboration with emerging firm OVO that will enable customers to purchase an xStorage home energy unit at a discounted price, enabling them to ‘sell’ back energy to the grid – not only helping to offset grid demand issues but also expected to result in an additional expected income for users averaging £350 per year. And Nissan also used the event to springboard plans to expand its existing outdoor charging network by 20% over the next 18 months. The company has already installed more than 4600 quick chargers across the region. Nissan now plans to invest in supporting the installation of a further 1,000 chargers over the next 18 months. Paul Willcox, chairman of Nissan Europe, said: “Step by step we are removing any barriers to electric vehicle adoption – from infrastructure investment, to how people access the power itself.